Do you suffer from joint issues? Most everyone realizes that to fully appreciate all life has to offer you want healthy joints that are comfortable and flexible. * Healthy joints make it more enjoyable to play ball with your grandson… go for a walk with your wife (or husband)… play golf. Fun stuff… The ‘stuff’ of which memories are made. Millions of Americans of all ages realize they could use additional support to help promote joint flexibility* – in order to help maximize their opportunities to be an integral part of their families and community. Joint relief so effective, you'll never go another day without it! Panitrol XL is a CLINICALLY TESTED new joint and muscle breakthrough product. The combination of all natural herbs in Panitrol work synergistically to help protect and support healthy joints. It is CLINICALLY TESTED to improve flexibility and mobility. Panitrol is an effective all natural joint and muscle supplement alternative. Panitrol is totally safe with no known side effects or drug interactions. All New Natural Ingredients that Work! We have combined the power of Glucosamine HCL in a vegetarian form, so those of you that are allergic to shellfish can now take it without any worry. Glucosamine, which occurs naturally in the body, plays a key role in the construction of cartilage, or the tough connective tissue that cushions the joints. Glucosamine stimulates the production of glycosaminoglycans (the key structural components of cartilage) as well as the incorporation of sulfur into cartilage. Sulfur is necessary for making and repairing cartilage. This is a type of arthritis caused by continuous wear and tear on the joints leading to inflammation, breakdown, and eventual loss of cartilage. A variety of studies indicate that Glucosamine supplementation aids in resisting cartilage degeneration, diminishing joint pain, and preventing functional impairment. 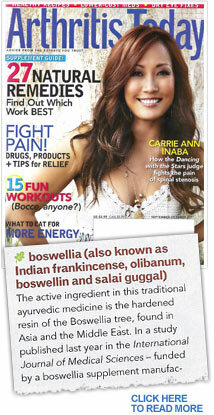 Growing evidence suggests that boswellia has anti-inflammatory effects. 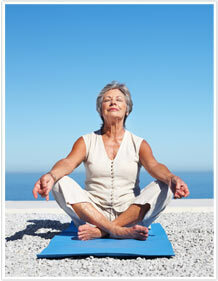 Arthritis Today Magazine calls it a must try in its latest edition. Hyaluronic Acid is a constituent of synovial fluid that lubricates the joints in the human body. The acid is a thick gel that not only lubricates the joints, but also protects them. Hyaluronic Acid acts like the oil in an engine. The oil of engine needs to be changed at regular intervals, since it loses viscosity and becomes thinner and less able to protect metal surfaces as it ages. Likewise, the viscosity of the leg or hand joint hyaluronic acid breaks down with age and gradually becomes unable to cushion the joint cartilage. This situation triggers depletion of the cartilage around the joints. Hyaluronic Acid has also been shown to lubricate and cushion joints. Juniper reduces the chronic pain signals to the brain, while desensitizing pain receptors. Some of the compounds in juniper are believed to close leaky capillary paths, thus reducing or cutting of altogether the source of the inflammatory substances and the plasma which cause the “swollen” condition. Golden is an aquaretic, increasing renal blood flow and glomerular filtration rate without stimulating the loss of electrolytes such as sodium and chloride. Goldenrod is an all natural diuretic and is considered safer than many synthetic diuretics that promote the loss of electrolytes. Therefore goldenrod safely sheds excess fluids from the affected tissues. Goldenrod has strong anti-inflammatory activity, attributed to flavanoids such as rutin, quercitrin, isoquercitrin, and nicotiflorin. Dandelion is considered the most powerful of herbal diuretics, and its action is probably the result of sesquiterpene lactones. The leaves are a rich source of potassium, which may make it the only naturally occurring potassium-diuretic, although its diuretic action is likely different from that of pharmaceuticals. At very high doses (much, much higher than even during the front-loading period of Panitrol relief), the leaves have been shown to posses diuretic effects comparable to the prescription diuretic frusemide (Lasix). Meadowsweet also contains many of the anti-inflammatory phytochemicals noted in connection with other herbs above. Willow, like meadowsweet, is a source of natural aspirin-like compounds collectively known as salicins. What Does Panitrol XL Do? Panitrol is a CLINICALLY TESTED new joint and muscle breakthrough product. Fenestra Research Labs performed a 30-day, 75-subject study using patients drawn from a large population of chronic arthritis sufferers. The patients were randomized into two groups and took either placebo or active treatment. The direct objective of this investigation is the performance of Panitrol XR formula compared to placebo in reducing chronic severe pain associated with arthritis. Beginning at Day 1 the two groups were not significantly different by the Mann-Whitney test. As the study went on, by Day four the active treatment group had significantly smaller median pain scores. This trend continued, until by Day 14 none of the treated group was reporting any pain. Not shown in Table 1 is the fact that from Day 13 on there was no reported pain among the treated group while the placebo group continued the same high pain levels. I have to take OTC relievers for my daily discomfort and two months ago I tried the 90 day Panitrol challenge. At the time I started the Panitrol, I was taking six to eight capsules of a popular OTC pain reliever per day, and I was still in severe discomfort. Within four days of starting the Panitrol, I noticed a reduction in the level of discomfort and was able to get out of bed without severe discomfort and stiffness. I have been living discomfort free for the last two months thanks to PANITROL! For me PANITROL met the challenge!!! Act now and we will rush you yourfirst free bottle of Panitrol XL.If you qualify for this exclusive online offer, your order will be shipped in 24-48 hours. Act now so you can start feeling the relief of Panitrol XL! The statements made on our websites have not been evaluated by the FDA (U.S. Food & Drug Administration). Our products are not intended to diagnose, cure or prevent any disease. Enzyme Labs' Panitrol XL is not affiliated with UCLA or any of the studies mentioned on the website. If a condition persists, please contact your physician. The information provided by this website or this company is not a substitute for a face-to-face consultation with your physician, and should not be construed as individual medical advice. The testimonials on this website are individual cases and do not guarantee that you will get the same results.